Helmuth von Moltke, Chief of the German General Staff from 1906 to 1914. He commanded Germany's armies at the beginning of the war, but was replaced after the German defeat at the Marne. Chief of General Staff of the German army sitting at his desk. 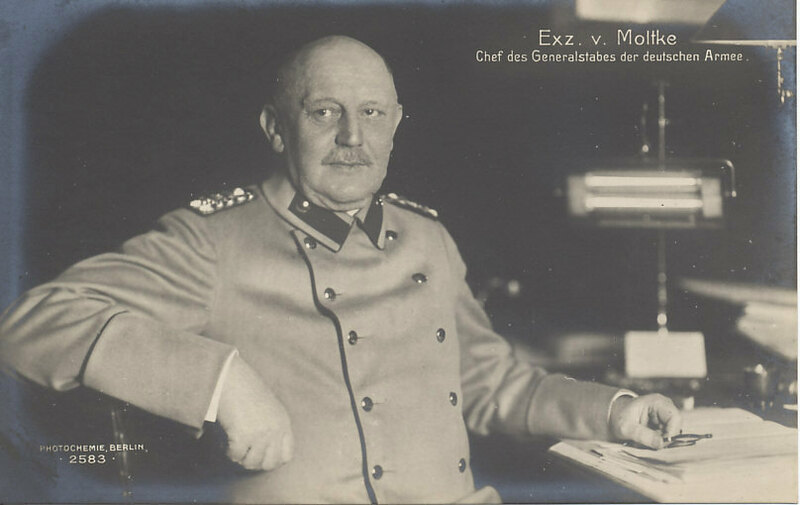 General Helmuth von Moltke was Chief of the German General Staff from 1906 until the Allied victory at the Marne. After the German defeat in the Battle of Gumbinnen General Prittwitz, commanding forces in East Prussia, received word that Samsanov's Russian Second Army had crossed the frontier from the south. He telephoned Moltke to say that he was falling back to the Vistula River, virtually abandoning East Prussia. Moltke promptly replaced him with General Paul von Hindenburg with Erich von Ludendorff as his chief of staff. On the Western Front von Moltke struggled to understand events. After their defeat in Belgium and in the Battle of the Frontiers, the Allies retreated from Verdun to the left end of their line. Moltke was concerned that his supply lines were overstretched, and that the Allied retreat was orderly, with the Germans taking few prisoners and little materiel. He advanced his headquarters from Coblenz in Germany to Luxemburg at the end of August, but Moltke did not visit the front, and had poor communications with his commanders. To get a better understanding of the situation, Moltke sent staff officer Major Richard Hentsch to the front. On September 9 and 10, with the Battle of the Marne in progress, Hentsch concluded the isolation of the First Army and the gap between it and the Second put both at risk. Hentsch approved the retreat of the Second Army, and ordered the retreat of the First. After Hentsch's report, Moltke ordered the retreat of the Third Army. Finally visiting the front on September 11, Moltke ordered a general retreat from Noyon to Verdun. Moltke had failed in executing the German war plan. On September 14, Kaiser Wilhelm replaced him with General Erich von Falkenhayn.